Cancer is a serious and complex disease which we feel requires a multi-disciplinary, multi-modality treatment approach in order to have great success and the best possible outcome. The problem is that current conventional cancer treatments are crude. Surgery to cut out the cancer can work, if it has not spread elsewhere in the body. Or, given that rapidly dividing cancer cells are more vulnerable to damage than normal cells, another approach is to blitz them with toxins -chemotherapy drugs – or radiation. In comparison, immunotherapy revolves around bolstering the body’s own defences so that they can mount an effective attack on cancer. Everyone has the power within them to heal cancer and all we have to do is to find a way to unlock our inner potential. Cancer immunotherapy is the stimulation, support, or other assistance of the immune system to help fight cancer. Historical data show that the immune system clearly plays a role in cancer progression. For example, immunosuppression is associated with cancer development. In fact, cancer is more likely to occur in people who take immunosuppressive medications than in people with normal immune function. Cell death can be achieved by fundamentally different mechanisms, apoptosis, necrosis and autophagy. Through which molecular and cellular mechanisms do cells die in normal tissues? Answering this question is of prime medical importance because homeostatic cell death is an important tumor suppressor mechanism, meaning that a reduced propensity to die is one of the hallmarks of cancer cells. Apoptosis, or programmed cell death, can indeed be considered as a constitutive anti-cancer mechanism that seems to be defective in more than 50% of cancers.When a cancer cell grows it activates two different pathways. The first stimulates cellular growth while the second, acting like a safety net, prevents the activated cells from dying from programmed cell death. There is a complex interaction between normal cellular growth and cell death if anything goes wrong. The second pathway protects the cells from dying prematurely. If we want to kill cancer cell, we need to inactivate its growth while inhibiting its ability to protect itself from small or large problems in its biochemistry. So, in brief, we need to induce as many problems as we can in its normal growth pathway, while simultaneously blocking its ability to adapt. Major tumor associated genes/pathways such as RAS, PI3K/AKT might not only decrease the overall sensitivity to chemotherapy but also directly effect cell death mechanisms. Hence, the failure to eliminate mutated (or epigenetically modified) cancer cells (or their precursors) by programmed cell death is an obligate step of multi-step carcinogenesis. Cell death can be induced by a family of death receptors including Fas, TNF (tumor necrosis factor) and TRAIL (Tumor necrosis factor-related apoptosis inducing ligand). One of the main mechanisms by which immune effector cells kill is by induction of apoptosis by Fas/FasL interactions. Fas (CD95 or Apo-1) is a transmembrane protein belonging to the tumor necrosis factor receptor (TNFR) family of cell surface molecules. Its ligation with specific agonistic antibodies or its cognate ligand (FasL or CD95L) induces the activation of a cascade of cysteines proteases, called caspases, and ultimately of nucleases that result in apoptotic cell death in many cell lineages. The recent identification of the Fas and FasL as a major regulator of both apoptosis and immune function has provided insight into an attractive mechanism of tumor escape from immune clearance. Fas is induced on activated T lymphocytes and targets them for subsequent elimination by FasL-expressing cells. Given the importance of the Fas/FasL system as a major mechanism by which T lymphocytes kill tumor cells, it is not surprising that tumor cells can use this system to evade immune recognition. Tumor cells may acquire resistance to Fas-mediated apoptosis by down-regulating Fas expression, secreting decoy receptors to block FasL on activated T lymphocytes, or by altering intracellular mechanisms mediating Fas-induced apoptosis. There’s another strategy. When some tumor cells encounter activated T cells bearing Fas, FasL/Fas interactions induce apoptosis of the T cell thereby terminating the immune response and providing immune privilege to tumors. TNF is a cytokine involved in systemic inflammation and is a member of a group of cytokines that stimulate the acute phase reaction. It is produced chiefly by activated macrophages, although it can be produced by other cell types as well. The primary role of TNF is in the regulation of immune cells. Unfortunately, two of these pathways, TNF and Fas, are toxic to both cancerous and normal cells. This makes activators of these pathways somewhat dangerous. Under certain circumstances, expression of FasL results in tumor removal, and overexpression of FasL results in an intense inflammatory response in several experimental models. Life and death by death receptors. A novel role of microtubular cytoskeleton in the dynamics of caspase-dependent Fas/CD95 death receptor complexes during apoptosis. The extracellular glycosphingolipid-binding motif of Fas defines its internalization route, mode and outcome of signals upon activation by ligand. Identification of a lysine-rich region of Fas as a raft nanodomain targeting signal necessary for Fas-mediated cell death. Involvement of raft aggregates enriched in Fas/CD95 death-inducing signaling complex in the antileukemic action of edelfosine in Jurkat cells. Targeting the Fas/Fas ligand pathway in cancer. The CD95 receptor: apoptosis revisited. CD95L/FasL and TRAIL in tumour surveillance and cancer therapy. TRAIL (Tumor necrosis factor-related apoptosis inducing ligand) is a death pathway. TRAIL is normally expressed in the human immune system and plays a critical role in antitumor immunity. TRAIL was cloned in 1995 and subsequent studies revealed its physiological functions in antitumor innate and adaptive immunity. TRAIL is required for natural killer cell-mediated immunosurveillance against the tumor progression and metastasis. TRAIL interacts with the death receptors, DR4 and DR5, and activates intracellular apoptotic pathway in cancer cells. Interestingly, it is totally non-toxic to normal cells, while retaining its ability to kill highly chemotherapy resistant cancer and leukemia cells. TRAIL can kill any cancer or leukemia cell regardless of their degree of malignancy. The TRAIL death pathway has emerged as an important therapeutic strategy. But activating TRAIL successfully isn’t easy. We need to stimulate TRAIL production and expression of the DR4 and DR5. We also need to overcome all the biochemical pathways that block TRAIL efficacy. Considerable numbers of cancer cells, especially some highly malignant tumors, are resistant to apoptosis induction by TRAIL, and some cancer cells that were originally sensitive to TRAIL-induced apoptosis can become resistant after repeated exposure (acquired resistance). TNF-related apoptosis-inducing ligand (TRAIL): a new path to anti-cancer therapies. TRAIL: a sword for killing tumors. 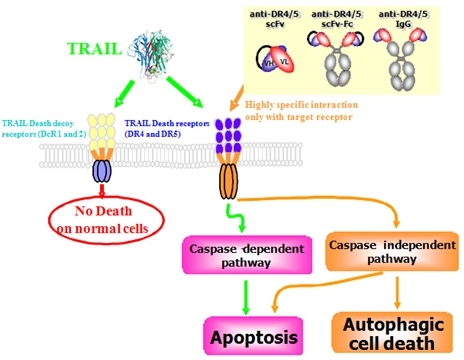 TRAIL death receptors and cancer therapeutics. TRAIL as a target in anti-cancer therapy. Mechanisms of resistance to TRAIL-induced apoptosis in cancer. Biological membranes are sheets of lipids that form barriers between compartments within cells or, in the case of the plasma, between the cell and its external environment. Membrane fluidity is a characteristic of cell membranes that depends on their lipid and protein composition. Membranes of tumor cells have been found to posess higher fluidity than membranes of nontumor cells. The types of lipids in a cell membrane can vary and abruptly form small islands of specific types, known as lipid rafts. Lipids are also linked to many proteins and, once attached, move the protein to specific places in membranes. Localization of the death receptor Fas to specialized membrane microdomains is crucial to Fas-mediated cell death signaling. Palmitoylation is the posttranslational addition of the 16-carbon palmitate group to specific cysteine residues of proteins via a labile thioester bond. Unlike other forms of lipidation, such as myristoylation and prenylation, palmitoylation is reversible which allows for dynamic regulation of protein-membrane interactions, trafficking between membrane compartments. The attachment of palmitic acid to the amino acid cysteine via thioester linkage (S-palmitoylation) is a reversible post-translational modification that occurs on diverse cellular proteins. Palmitoylation modulates protein function by facilitating targeted membrane association, interaction with other proteins, and determining subcellular localization. Intracellular palmitoylation reactions are mediated by a family of recently identified palmitoyl transferases. Fas/CD95 death receptor and lipid rafts: new targets for apoptosis-directed cancer therapy. Lipid rafts and Fas/CD95 signaling in cancer chemotherapy. Palmitoylation of membrane proteins (Review). The fat controller: roles of palmitoylation in intracellular protein trafficking and targeting to membrane microdomains (Review). Palmitoylation of intracellular signaling proteins: regulation and function. Palmitic acid, also called hexadecanoic acid, is one of the most common saturated fatty acids. It is found in palm oil but also in butter, cheese, milk and meat. Fatty acid synthase (FASN) synthesizes palmitic acid in the body. Palmitic acid is converted to ceramide, the death lipid. Ceramide is made from palmitic acid and the amino acid serine. Neither of these molecules is plentiful in our diets. Ceramide is also used as a building block for the synthesis of other lipids. Since ceramide is a toxic lipid and is involved in the induction of apoptosis (programmed cell death), its synthesis is thghtly controlled in the body. Fatty acid synthase drives the synthesis of phospholipids partitioning into detergent-resistant membrane microdomains. Differential regulation of ceramide in lipid-rich microdomains (rafts): antagonistic role of palmitoyl:protein thioesterase and neutral sphingomyelinase 2. Sphingolipids and cancer: ceramide and sphingosine-1-phosphate in the regulation of cell death and drug resistance. Metabolism of short-chain ceramide by human cancer cells–implications for therapeutic approaches. Palmitoylation is required for efficient Fas cell death signaling. S-palmitoylation of Fas in its cytoplasmic domain, which consists of the reversible addition of a palmitic acid to a cysteine, represents an essential signal targeting Fas to rafts. Palmitoylation allows Fas to associate with the cytoskeletal protein ezrin, reported to be critical for Fas mediated cell death. Indeed, the FasL-induced internalization of Fas receptor has been shown to occur in the clathrin-dependent pathway and is a prerequisite for DISC (death-inducing signalling complex) formation, which occurs predominantly in endosomes. Palmitoylation of TRAIL death receptor DR4 is also required for efficient TRAIL-induced cell death signaling. If the TNF, FAS and TRAIL death receptor pathways worked as designed, there would be no cancer, leukemia or autoimmune diseases. These receptors are responsible for killing defective cells by the non-inflammatory process of programmed cell death. However, some other palmitoylated proteins such as Wnt and Hedgehog proteins are involved in cellular differentiation and growth. Palmitoylation is required for efficient Fas cell death signaling. Palmitoylation of human FasL modulates its cell death-inducing function. Lipid raft localization and palmitoylation: identification of two requirements for cell death induction by the tumor suppressors UNC5H. Palmitoylation of CD95 facilitates formation of SDS-stable receptor aggregates that initiate apoptosis signaling. Palmitoylation of the TRAIL receptor DR4 confers an efficient TRAIL-induced cell death signalling. Overexpression of fatty acid synthase is associated with palmitoylation of Wnt1 and cytoplasmic stabilization of beta-catenin in prostate cancer. Membrane targeting of palmitoylated Wnt and Hedgehog revealed by chemical probes. T lymphocytes play an important role in immune surveillance against intracellular pathogens and tumors. Signal transduction through CD90 regulates cytokine production by CD4+ T helper cells, as well as expression of TRAIL, FasL, granzyme B and perforin by CD8+ cytotoxic T cells (CTL), and the induction of CD4+ regulatory T cells. Cytokines, including IL-2, IL-12, and IFN-gamma, are important inducers of the cytotoxic effector molecules that are involved in tumor cell and allograft destruction by the cell-mediated immune response. Granzymes and perforin are known to be important mediators of target cell destruction. TRAIL and FasL expressed by CTL also trigger apoptosis in susceptible target cells. Regulatory T cells are essential for the maintenance of immunologic homeostasis. Current concepts of tumor-infiltrating lymphocytes in human malignancies. Signaling defects in anti-tumor T cells. Antimicrobial and immunoregulatory effector mechanisms in human endothelial cells. Indoleamine 2,3-dioxygenase versus inducible nitric oxide synthase. Positive and negative consequences of soluble Fas ligand produced by an antigen-specific CD4(+) T cell response in human carcinoma immune interactions. A critical role for granzymes in antigen cross-presentation through regulating phagocytosis of killed tumor cells. Reciprocal granzyme/perforin-mediated death of human regulatory and responder T cells is regulated by interleukin-2 (IL-2). Anticancer properties of the IL-12 family–focus on colorectal cancer. Active immunity may be the ideal of immunotherapy. Coley’s toxin was the first documented attempt in the U. S. to treat cancer by stimulating the immune system. It was first developed in the 1890s by William B. Coley, MD, who noted that patients who developed bacterial infections after surgery for sarcoma had visible regressions of their cancers. Because using live bacteria was dangerous and because he determined that immune reactions depended upon the toxins of the bacteria rather than the actual bacteria, he eventually mixed toxins of the Streptococcus and Bacillus prodigiosus bacteria. Some regressions of cancer were reported among patients treated with these toxins from the 1890s until the 1950s when the treatment largely fell into disuse with the advent of radiotherapy and chemotherapy. The stimulated human immune system is a whirling tempest of different physiological and biochemical responses, and even now there’s much uncertainty about how Coley’s Toxins modified this complex mechanism to better attack its cancerous target. We know now that tumors are immunogenic. The question is why, if tumors are immunogenic, do cancers grow? We know an immune response is elicited, yet what prevents the immune response from obliterating the cancer? When cells become cancerous they produce new, unfamiliar antigens. The immune system cells recognize marker proteins (antigens) from the foreign agents and produce proteins (antibodies) that interact with the antigen and ultimately destroy them. Another way the immune system works is by sensitizing a class of immune cells, the T-cells to recognize the foreign agents and destroy them. The immune cells recognize these cells as foreign because of the presence of surface markers. All cells have surface markers. Most tumor antigens are “self” proteins, rendering them weakly immunogenic. Our immune systems tolerate self-proteins, and tolerance is a major mechanism by which cancer can evade immune recognition. Tumor cells must develop strategies to avoid clearance by the immune system to survive, expand their populations, and metastasize. As tumors grow, they secrete immunosuppressant factors. Thus, tumor cells may escape immune clearance by altering immune recognition or by modulation of the cytotoxic response. This immunomodulatory effect occurs directly, by viral proteins binding to immune receptor molecules and thus preventing their expression on the surface of the virally infected cell, or by tumors secreting factors that downregulate immune activation. Choosing a conventional cnacer treatment is not easy. Conventional treatments, such as chemotherapy and/or radiation therapy, do nothing to eliminate the cause or prevent recurrence of cancer. But there is hope. With natural phytochemicals and anti-cacer agents, we can now stimulate death receptor pathways, block many of the anti-cell death pathways that inhibit death receptor efficacy and stimulate the anti-cancer immune response. We can also modulate the anti-cancer immune response, thus leading to better immune surveillance. A number of naturally occurring compounds (phytochemicals) isolated from herbs, fruits and wild mushrooms are able to kill neoplastic cells through a variety of mechanisms. In many cases, the anti-cancer activities of phytochemicals involve inhibitory effects on the activation of transcription factors that promote tumor cell survival, metastasis and resistance to induction of apoptotic cell death. Induction of apoptotic cell death by ursolic acid through mitochondrial death pathway and extrinsic death receptor pathway in MDA-MB-231 cells. Ursolic acid induces PC-3 cell apoptosis via activation of JNK and inhibition of Akt pathways in vitro. Involvement of mitochondria and recruitment of Fas/CD95 signaling in lipid rafts in resveratrol-mediated antimyeloma and antileukemia actions. Resveratrol enhances the expression of death receptor Fas/CD95 and induces differentiation and apoptosis in anaplastic large-cell lymphoma cells. Lupulone, a hop bitter acid, activates different death pathways involving apoptotic TRAIL-receptors, in human colon tumor cells and in their derived metastatic cells. Quercetin enhances TRAIL-mediated apoptosis in colon cancer cells by inducing the accumulation of death receptors in lipid rafts. Sulforaphane blocks hypoxia-mediated resistance to TRAIL-induced tumor cell death. Resveratrol induces apoptosis of human nasopharyngeal carcinoma cells via activation of multiple apoptotic pathways. Induction of apoptosis by rhapontin having stilbene moiety, a component of rhubarb (Rheum officinale Baillon) in human stomach cancer KATO III cells. Activation of multiple apoptotic pathways in human nasopharyngeal carcinoma cells by the prenylated isoflavone, osajin. The role of nutraceuticals in the regulation of Wnt and Hedgehog signaling in cancer. Current findings, future trends, and unsolved problems in studies of medicinal mushrooms. Mushroom lectins: current status and future perspectives. The good news is that we are getting close to a true, non-toxic and effective natural anti-cancer/ anti-leukemia formula. Alternative cancer treatments really work. Most of the trials have confirmed the clinical efficacy of Hepazym immunotherapy in patients with lung cancer, liver cancer, colorectal cancer and lymphoma. What we try to achieve with active immunity induced by Hepazym immunotherapy is an endogenous immune response, where the immune system is primed to recognize the tumor as foreign. This approach has been successful in patients with liver cancer, lung cancer, colon cancer and lymphoma, as their immune systems are unable to mount a sufficient response. In the past several years, efforts have focused on using active immune therapies in patients with minimal disease. However, we have seen that the immune system can be quite functional despite advanced stage cancer when the patient has been treated to maximal response. We have recently shown that Hepazym activates the extrinsic pathway of apoptosis in several different human cancer cells, without harming normal cells. Hepazym shows induction of apoptosis in T leukemia cells. In addition, Hepazym inhibits the proliferation and migration of human endothelial cells, and also inhibits growth factor-stimulated blood vessel development. Hepazym might therefore be able to reduce tumor progression by both a direct cytotoxic effect on the cancer cells and by inhibiting the development of tumor vasculature. Hepazym offers a number of potential advantages over conventional chemotherapeutic agents. Hepazym immunotherapy is nontoxic and is predicted to be effective against multidrug-resistant variants of cancer cells. Hepazym therefore show potential for the treatment of metastatic cancer. Our goal is to reduce cancer to the lowest common demoninator so it can be killed with the most basic of weapons. And Hepazym immunotherapy fulfills that goal perfectly. Keep in mind that this immunotherapy applies to all cancers and leukemias. Many people have contacted us after the fact and have told us that they or their loved ones have experienced major benefits, including the reduction in size, or complete disappearance of abnormal growths, when they took enough of Hepazym and Hepazym-F (Fermented Medicinal Mushroom Extracts, Liquid Herbal Minerals) for a long enough period of time. A 49-year-old male, South Korean, presented with Stage II hepatocellular carcinoma (liver cancer) caused by HBV. In February 2011, the surgery took place and was a success. In June 2011, cancer has recurred. Serum DCP (PIVKA II) level elevated to 110. He began taking 40 ml (10 ml 4 times) of Hepazym and 20 ml (10 ml twice) of Hepazym-F daily, and the hospital treatment was discontinued. As of September 2011, serum DCP (PIVKA II) level markedly decreased to normal range. The production of Interleukin-2 (IL-2) in his body multiplied because of Hepazym administration. IL-2 has shown antineoplastic activity and has also an antiviral effect. By November 2011 the tumor had disappeared. Conclusion: The decrease of serum DCP (PIVKA II) level and the elevated serum level of IL-2 during immunotherapy with Hepazym predicts a possible new therapeutic option for HBV and HCV induced liver cancer and chronic viral infections. With over years of safe use, the effects of the herbs in Hepazym have now been proven to be true. Of course today we know mechanism of the herbal synergy of the Hepazym formula supports the body’s natural healing mechanisms by activating all of the body’s natural healing pathways (immune system, digestive, circulatory, lymphatic, liver, bowels, kidneys, skin, and lungs). The healing synergy of the phytochemicals, super saccharides, immune molecules, antimicrobial peptides, organic plant based enzymes, pre- and probiotics and antioxidants in the herbs comprising Hepazym gently enhances the natural ongoing healing systems of the body, bringing them back to a more optimal state of activity. It does not “force” the body into an unnatural healing mode. Hepazym can be used daily as a natural cellular defense, liver cleanse and lung cleanse, gastrointestinal support, immune support and immune modulation for treatment of cancer and chronic infections. Most of the healthy cells in the body can and will regenerate, if there are enough of them and the body is not too exhausted. Hepazym immunotherapy brings the body back into balance, starting a rebuilding and re-education process, so there is the potential for restoration. Keep in mind that Hepazym immunotherapy is an herbal remedy, and as such, although it is very effective, it can take time. So perseverance is needed. Appetite may improve as taste buds, diminished by treatment, are restored. The pain level may reduce or disappear altogether. Energy may increase, as the detoxifying takes place. Bodily functions, such as anti-cancer immune response, may normalize themselves. Test results may also show marked improvement. Sleep patterns may improve, as it is a natural sedative, and calms the body. Outlook in life may become more positive, giving you a sense of well-being.